Time and again, Postbank offers very good deals with various added benefits such as free account without maintenance charges, account opening bonus etc. when you open an account online, either between particular days or particular times. 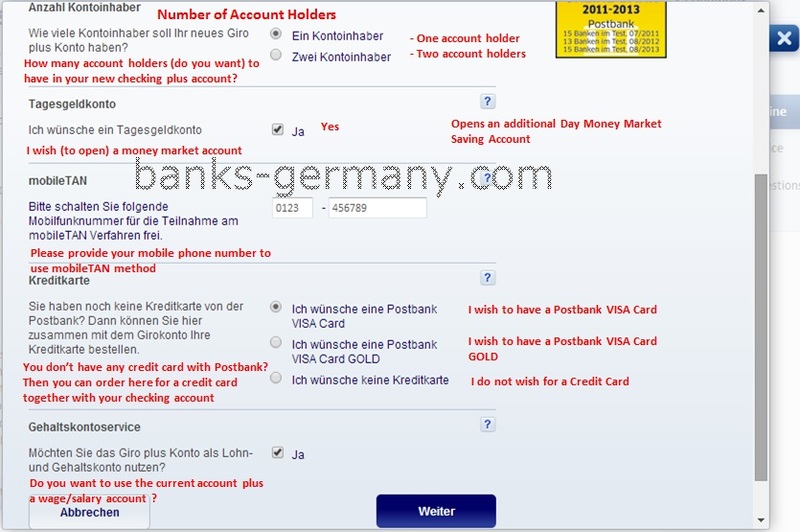 Check here for any current Postbank offer right now. Therefore, opening an account online not just provides ease of opening but also provides more benefits than opening an account through the bank branch. 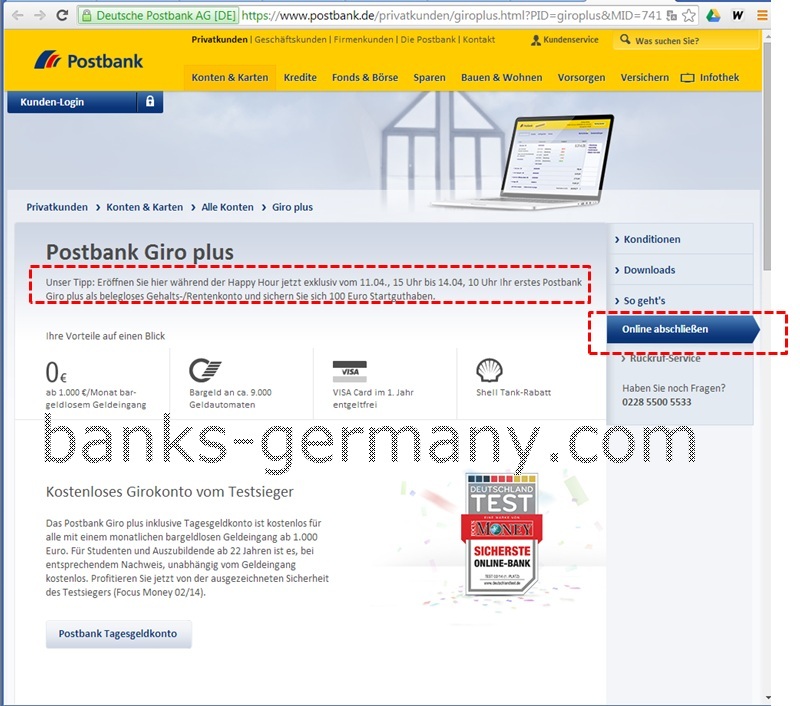 The below article aims at providing a step by step guide on how to open a Postbank GiroPlus bank account online during Happy hour. The same can be used to open a bank account even when no happy hour offer is provided. Click the Postbank online application form here to go to the startpage. This will open the below page. The above page changes based on what the current offer is. Check the page to see what are the current conditions and bonus available. This can be seen on top of the page as a tip (highlighted in dotted red box). When no offer, usually no such tip will exist. However you can still continue to open a bank account online using the below steps. An online application page opens. There may also be information about offer available. However, this page changes based on what the current offer is. However you can still continue to open a bank account online without such offer. Fill the online application form for the services needed. In case you were born in the USA or have a US citizenship, continue to fill the below information, if not ignore the below. This is for the purpose of meeting the regulations imposed by US government in the FATCA regulation. Provide the Address details. Screenshot of the webpage with an English translations is provided below. If you have not lived in the address for more than 3 years, you may need to provide your previous address. 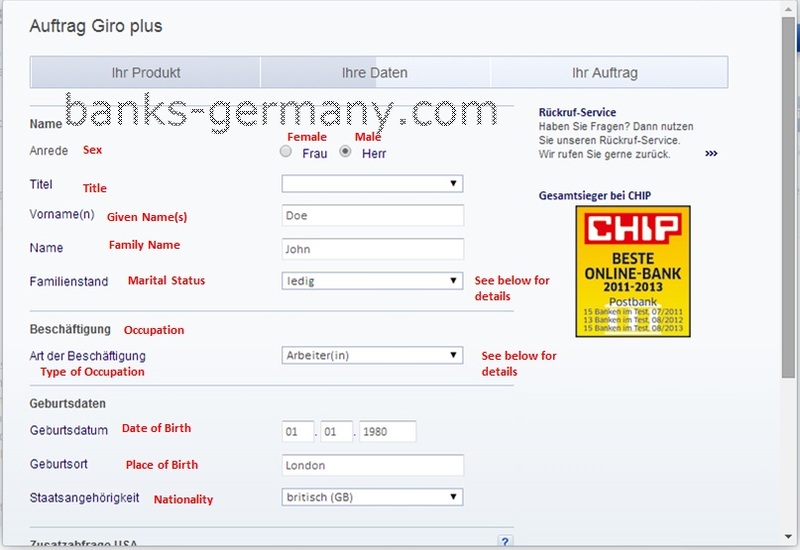 This is for the purpose of checking your Schufa score (German Credit Score). In case you lived outside Germany, provide your old foreign address. Check if the details you entered are correct. If not, go back (Zurück) and change the required details. 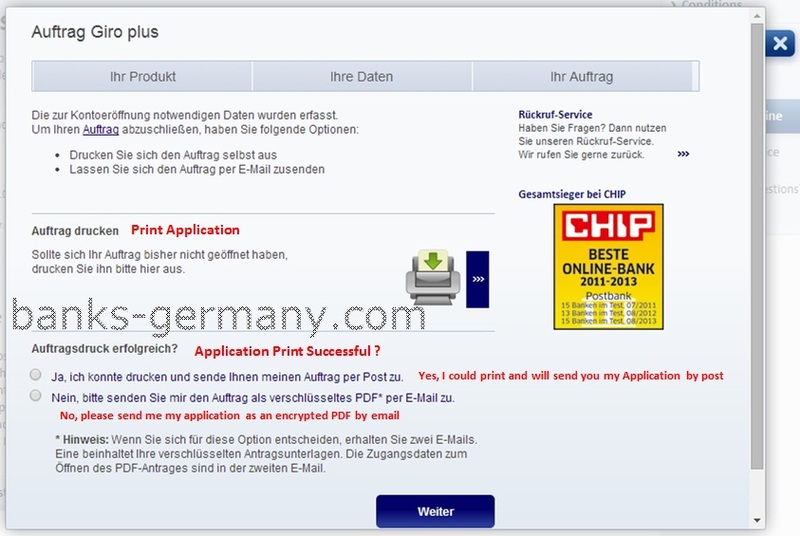 If all the details are correct click print Application (Auftrag drucken) to submit the application and generate the filled-up PDF-application. After submitting the details, you can generate and print the filled up PDF application form. 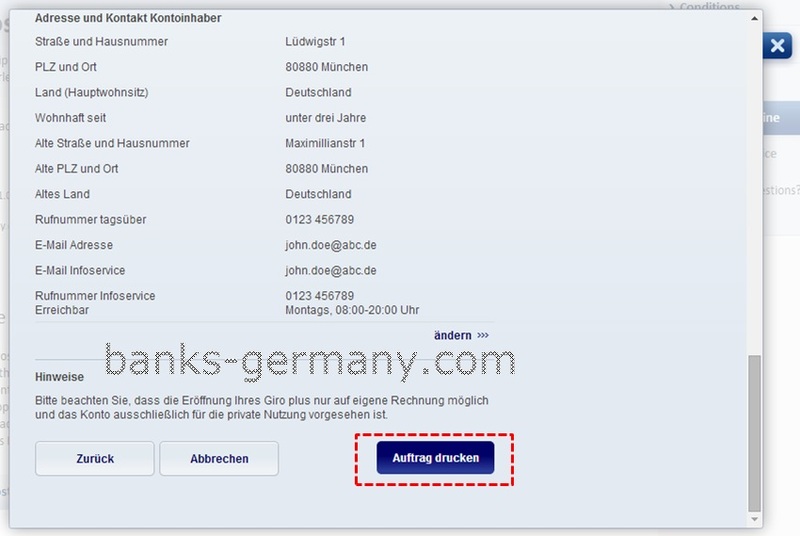 Click on Auftrag drucken to generate the PDF application form and print it. You can also send the application form to your email address and print it later. 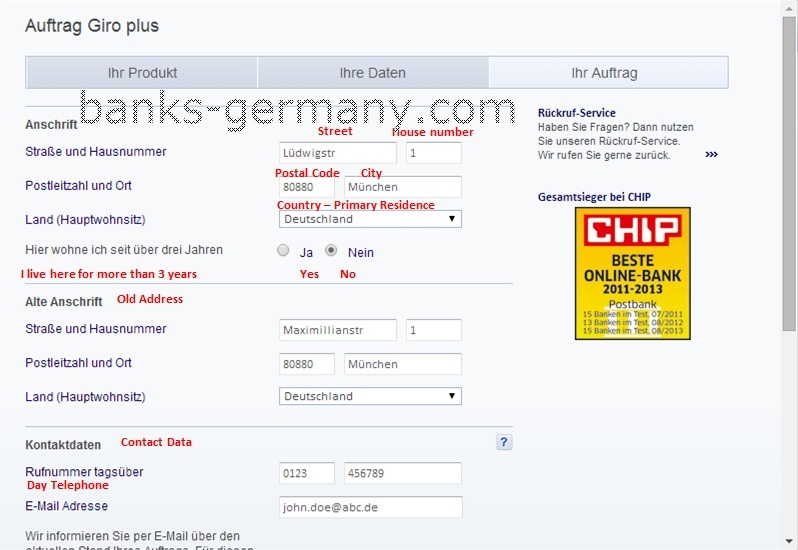 Go to any nearest DeutschePost post office or Postbank Center. To find out the center which is closest to you, click Postoffice Finder. 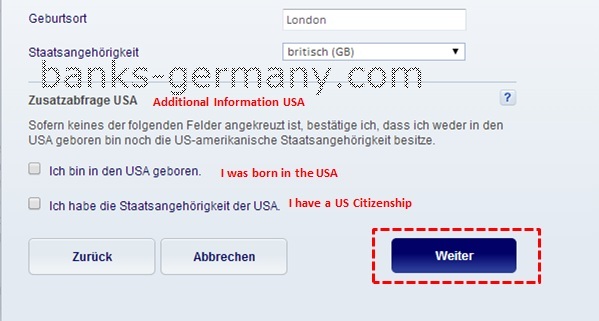 Type in the city, postal code or the name of the street and under the option”alle speziellem service” select the option for “PostIdent”. You will be showed on the map the Postoffice branches closest to you. Sign the application form in front of the Clerk at Postoffice. He will check the details on the application form with the details on the details on your passport and verify the signature. Then he will send the application form to the required address free of charge. Note : Depending on the conditions of the offer, please ensure that it is either the time when the application process is completed (i.e all the steps), and it may not be enough if you merely completed the form on time but failed to complete the process. helloo , please! i need help— can u tell me how to open it. if im now out of Germany… im in Guatemala now. but i need to open an account for student t blocked one. so.. can u tell m.. all t info. to do it.. and then transfer t money.. is for my studies in Germany.. is German curse… , as soon as possible..! please! thanks..
wonderful put up, very informative. I wonder why the opposite experts of this sector do not realize this.